I’ve grown very fond of beets this summer. What began as an innocent summer romance, as the longer days allowed us to get to know each other over hot coals and crisp lettuce leaves, has since blossomed into a full-blown affair. Every Sunday I anxiously scan the produce at Chino Farms searching out the beautiful red, pink and orange bulbs. And with names like sugar beets and candy striped beets how could you not be swept away? For a child who grew up liking the taste of wet dirt and the smell of concrete when it rained you would probably be surprised that I didn’t always like beets. In fact, it wasn’t until my mother in law introduced me to them that I would even look twice in their direction. She taught me how to love them from the greens down and boy I have been missing out! 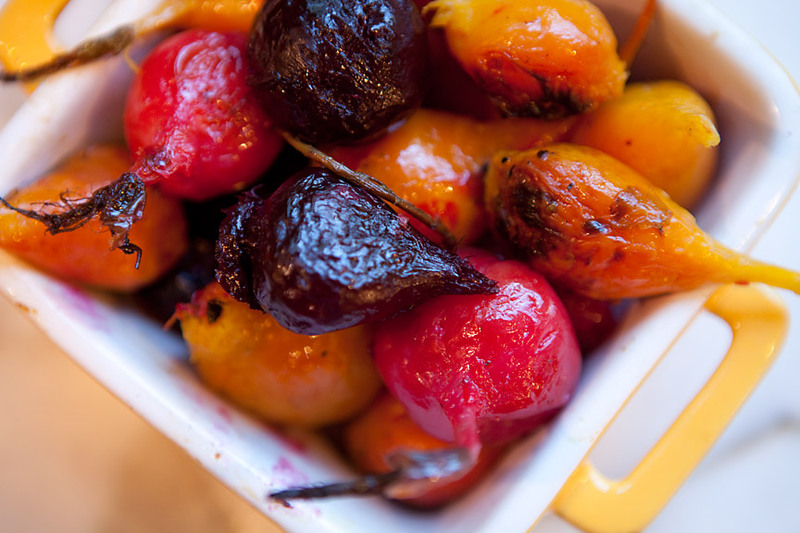 I prefer to cook with baby beets because they cook quicker, have a sweet, earthy flavor and their young greens lend to a lemony flavor that is highlighted when you give them a glug of red wine vinegar. 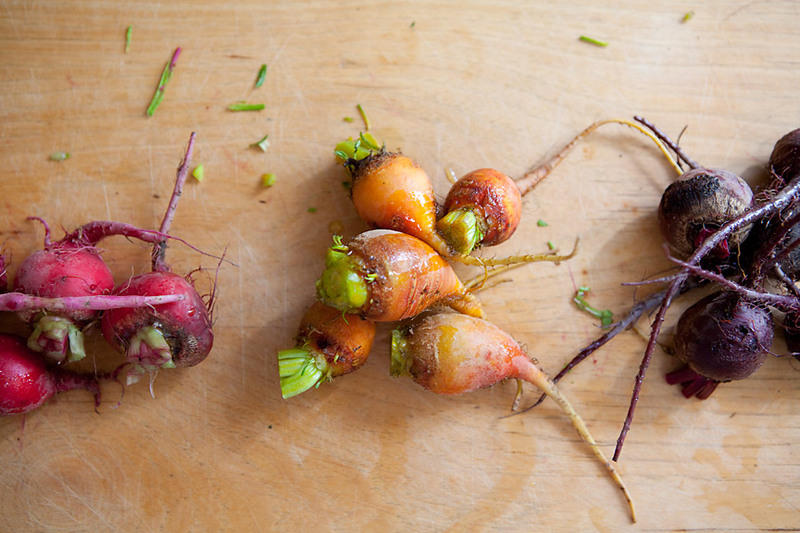 Plus, baby beets have a cuteness factor that dare I say it…rivals the likes of puppies and kittens. Ok – maybe that’s a bit of an exaggeration but you get the point. Anyway, my favorite way to devour them at the moment is to roast them on the grill until they are fork tender and then toss them in a salad of fresh greens, edible flowers and goat cheese, then season with a classic lemon and olive oil dressing. This may not be very innovative or unique considering it’s on nearly every restaurant menu in San Diego but that doesn’t mean it shouldn’t be shared. Plus if you eat it at a restaurant they probably won’t share the greens which are quite possibly the best part! 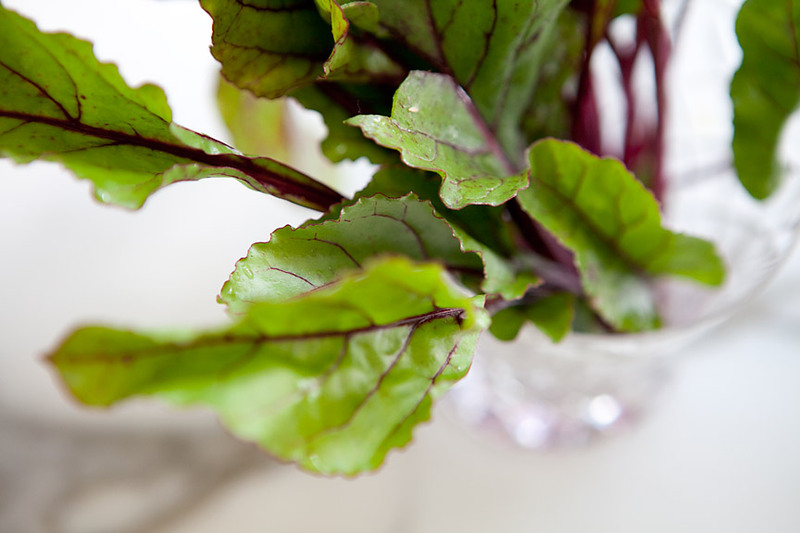 Cooking beet greens is easy as can be. I prefer to use the grill whenever the weather allows, but the stove works great as well. Make a little boat out of foil to hold your greens along with a splash of white wine or water, garlic and lemon juice. Seal your bowl up with a foil lid and let it steam on the grill for about 15 minutes. Season it with salt and good splash of red wine vinegar and you’ll be wondering why you haven’t eaten these your entire life. Oh – and if you haven’t already noticed…welcome to the new and improved cb&j blog! Steve and I have been eating bowls of watermelon and becoming CSS experts so we could make this pretty little blog a little more cb&j. Let me know what you think! Download a PDF of this recipe here: beet_salad_cbj. Cut the greens off the beets and reserve for later. Make little foil pouches for each bunch of beets (I don’t like to mix the colors and this prevents bleeding). Drizzle with olive oil and a sprinkle of salt. Close the foil up tight and put on the grill over medium heat for about 20 – 30 minutes. Alternatively, you can roast them in the oven at 375º for 30 minutes. When the beets are fork tender, take them off the grill and let them cool long enough to handle them. Peel the skins off and cut into quarters. Set aside. 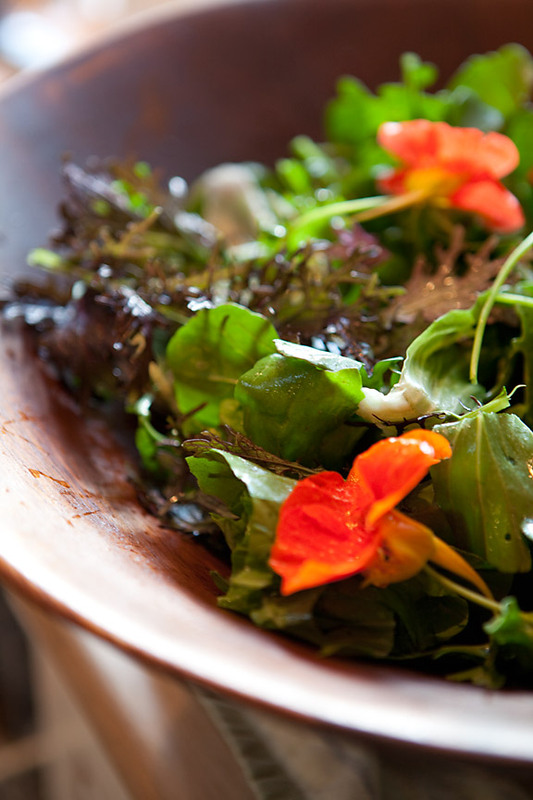 Add your greens to a bowl and toss with the olive oil. The trick is to pour the oil along the edge of the bowl in one steady stream, then toss with your hands until the leaves are lightly coated. Now squeeze the lemon, start with one half and season with salt and pepper. Toss again and taste. Adjust the seasoning to your liking. 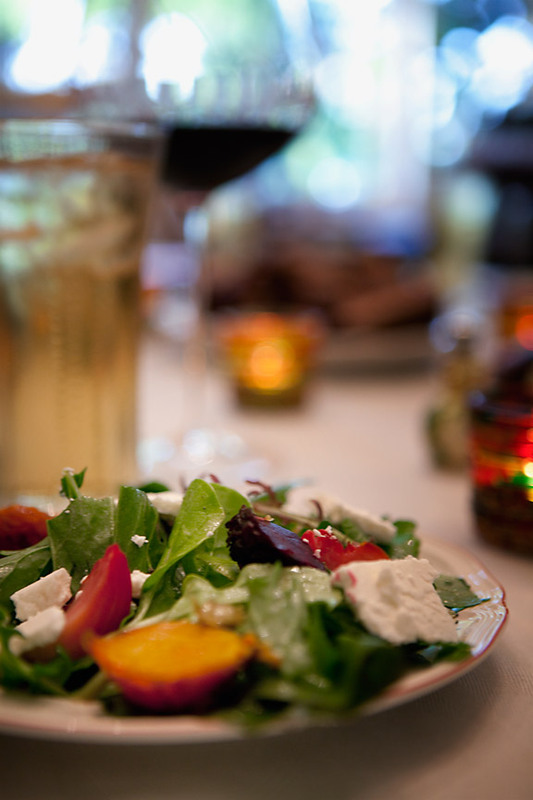 Place the salad on a small plate, sprinkle with a couple of the flowers, beets and crumble a little goat cheese.